The Minister for Finance and Economic Planning Uzziel Ndagijimana arrives at Parliament for a past national budget reading (file photo). Members of Parliament yesterday approved the proposal by the Government to increase public spending for this fiscal year by Rwf141 billion. While the previous budget for the 2018/2019 fiscal year was slightly over Rwf2.4 trillion, the revised budget is slightly above Rwf2.5 trillion. The Government proposed to increase the budget late last month during a cabinet meeting and went ahead to seek parliament's approval. The Minister for Finance and Economic Planning, Uzziel Ndagijimana, said that the money to cater for increased public spending will be raised through taxes and non-tax revenues, which exceeded government forecasts in the first half of the fiscal year. The Government is increasing spending in order to support key projects in infrastructure, education, agriculture, and healthcare among other sectors. "We would like to allocate the money for priority activities in key sectors such as education, agriculture, and new government agencies," Ndagijimana told The New Times last month. About Rwf3.3 billion of the budget increment will be used for the next four months to pay teachers' wages, which were increased by 10 per cent last month, the minister said. 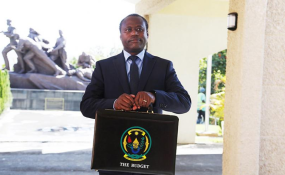 The current budget, which runs up to June 30, 2019, was designed under the theme; Industrialisation for Job Creation and Shared Prosperity in order to emphasise government's will to invest in supporting local industries as it seeks to bolster production and create more job opportunities, mainly for the youth. The portion for the development budget has mainly been allocated to boosting youth employment programmes, with an aim to create 216,000 off-farm jobs and empower the youth with new skills. The Government has also been investing in building roads, increasing irrigation projects, building new and repairing key electricity transmission lines, improving water supply in both rural and urban areas, and building hospitals and classrooms among other priorities in the current year. The Government plans to finance the current budget by 68 per cent through domestic resources, 16 per cent through loans, and 16 per cent through grants. It has planned that spending of the budget will go into funding three pillars, with the economic pillar taking the lion's share at 57 per cent of the budget, social welfare claiming 27 per cent, while good governance takes 16 per cent.